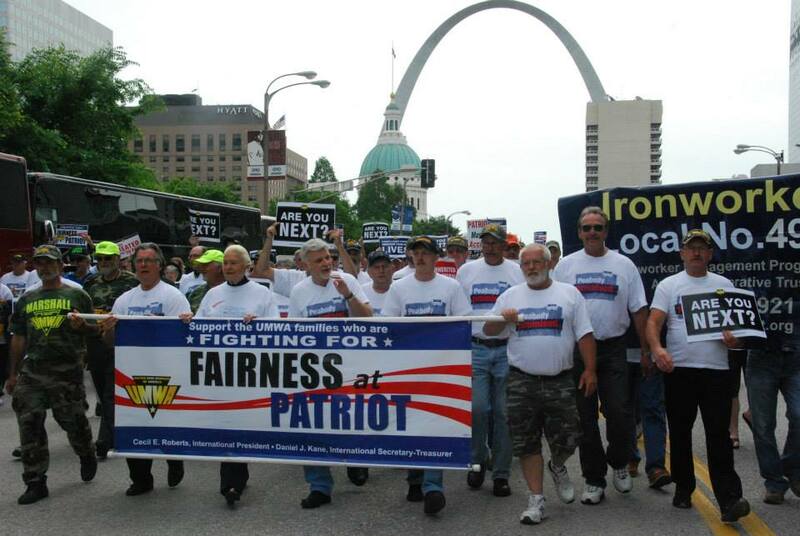 July 21, 2015 by Ken Ward Jr.
Patriot Coal wants a bankruptcy judge’s permission to reject the company’s collective bargaining agreement with union miners and change retirees’ health care benefits … Patriot wrote that it would otherwise run out of cash and have to liquidate in a matter of weeks. Patriot said the move would be necessary to close on a proposed partial sale to Lexington, Kentucky-based Blackhawk Mining LLC. Otherwise, the United Mine Workers of America would need to reach collective bargaining terms with Blackhawk, which doesn’t want to contribute to the pension plan. Patriot wrote that discussions with the UMWA and Blackhawk are at an impasse. You can read the court filing for yourself here or here. Last Friday, the United Mine Workers of America filed an objection to Patriot Coal’s proposed bankruptcy plan, which includes $6.4 million in bonuses paid to management employees. The UMWA says Patriot’s proposed “key employee” bonus plan would benefit only the top executives. The union is concerned that the plan will ultimately lead to union miners having to take pay cuts, reduce their benefits, or even losing their jobs. Patriot is going back to bankruptcy to squeeze more concessions from miners. Walker has also declared bankruptcy. Alpha Natural Resources is today worth 9 cents a share, Arch Coal is going for 20 cents a share, and Peabody is down to $1.13. These companies have gone from riches to rags in a few short years, due to market forces primarily. They will certainly be asking miners to take pay cuts, give up benefits, etc. They will be asking state and federal governments for relief from regulations, asking for tax cuts, and bailouts. If so, should Republicans deny a helping hand, as they did with the Auto Industry bailout? Should Democrats go along with a bailout, but with appropriate strings attached? If so, what should those strings include – solidarity with the unions, or not? How about a carbon tax? Or should these corporate losers be sold off to some vulture corporation, maybe owned by the Chinese?